Built upon the fundamentals of exceptional customer service, a passion for hair and a continuous commitment to education, Omaha’s Hair Choice has been faithfully serving the greater Omaha area for more than 30 years. As a full-service salon, we offer color, haircuts, facials, airbrush makeup applications, special event styling, waxing and more. The roots of Omaha’s Hair Choice began like many start-up businesses do — as a stepping stone investment to help fund a future dream. Peggy Viers (1960-2018) enrolled in beauty school during her teenage years in hopes of earning enough money to attend veterinary school. Never losing the eagerness to serve or her strong work ethic, Peggy’s dream took an unforeseen turn as she found herself opening the doors to Omaha’s Hair Choice in 1985. For decades, Peggy led the salon to incredible growth, numerous awards and a huge following of loyal clientele. 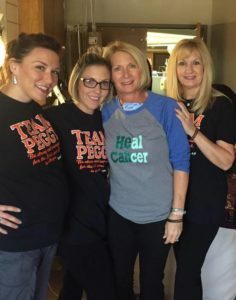 It is with heavy hearts to report after a hard-fought battle with cancer, Peggy passed away on January 8, 2018. Omaha’s Hair Choice holds our beloved founder, mentor and friend close to our hearts. Together, we are committed to continuing Peggy’s vision with the same passion, creativity and dedication she instilled in us and look forward honoring her legacy by serving you at Omaha’s Hair Choice. We can’t wait to help you look and feel beautiful from the inside out. We are a team committed to continuing education and knowledge of trends that change with every season. Each new stylist has been mentored by a more advanced stylist for 6-9 months to insure the highest quality of service. We represent an accumulation of years of experience. Therefore, we have levels of pricing. In addition to delivering exceptional results, we believe that the way we treat our customers sets us apart from our competitors. We will give you a call, text or email to remind you of appointments, and another call following any color or permanent wave services to confirm your satisfaction. In addition to customer service, we are dedicated to service to our community. Our annual canned food drive has raised more than 25,000 lbs. of food for the Salvation Army and area food banks. We’ve also been proud to support the Juvenile Diabetes Foundation and initiatives that provide school supplies for local students and teachers. If you’re a returning client, we want to thank you for your business and your friendship, and we want you to know that you are automatically enrolled in our loyalty program. Global rewards are accumulated each visit on services and product purchases. You are able to use you Global Rewards on Make-up, Make-up brushes, styling tools, skin care, nail care, ALL hair care (even gift sets) and services EVERY visit. As a team committed to extensive training and the pursuit of continuing education, we will build a loyal clientele by providing extraordinary value through our expertise, creativity, and exceptional customer service.